Here’s a discussion about escutcheons. Escutcheons, also known as trim plates, sleeves, design rings or extenders, are a very important and necessary part of any fire sprinkler system. Sprinkler heads in ceilings or walls must have proper fitting escutcheons according to NFPA 13, 25 and 101 code. Why? Sprinkler heads are commonly installed in drop ceilings by using a hole saw to accommodate the sprinkler head. The escutcheon is necessary to cover the gap between the sprinkler head and the ceiling tile or drywall. They provide a finished aesthetic look but are key to the sprinkler head activating properly. Without a properly fitting escutcheon, heat and smoke will rise up above the ceiling through the gap and may delay the activation of the sprinkler head. Furthermore, if smoke detectors are present, activation could be delayed, jeopardizing early detection and life safety. 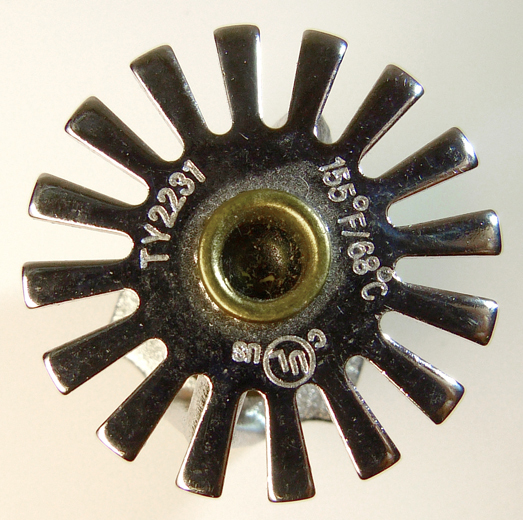 Each manufacturer of Fire Sprinkler Heads designs escutcheons specific to that particular head. 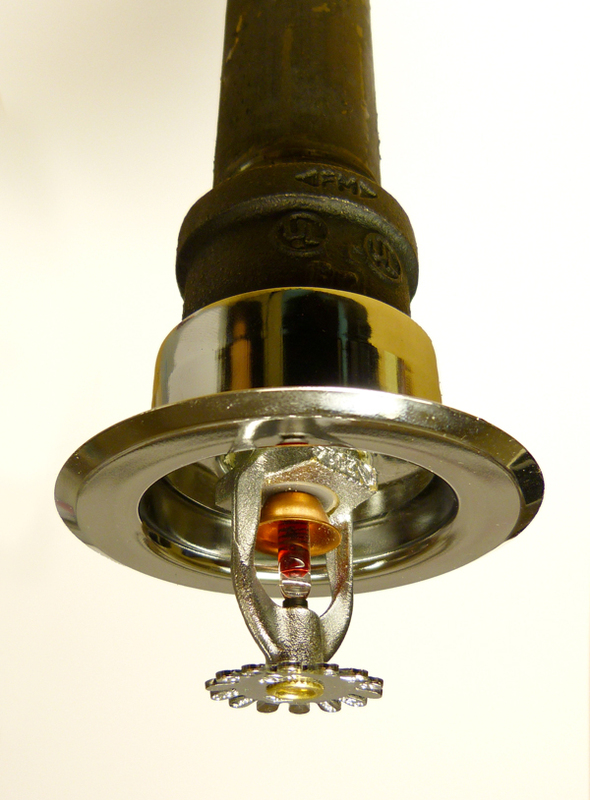 There are hundreds of individual size Escutcheons within the three common types of fire sprinkler escutcheons. The only way to get the right one is to know the manufacturer brand and model number of the fire sprinkler head. See markings. Most common in drywall or ceiling tiles. The two piece escutcheon provides a finished appearance with the outer ring covering the gap while the inner ring sits at a specific depth encircling the recessed sprinkler head. This type of escutcheon properly covers the gap for a flush sprinkler head, one that is neither recessed or extended from the ceiling or wall. These are commonly used when the distance between the branch line (main sprinkler pipe for that area) and the ceiling or wall vary. Adjustable escutcheons have two pieces, a cup and a skirt. A standard cup allows for up to 2” of adjustment to properly fit around the sprinkler head, while the skirt covers the gap. Extensions are available for greater than 2” of space. Manufacturer escutcheons are installed with the installation of the sprinkler heads themselves. Escutcheons need to be replaced if they become damaged (bent or separated), rusted, discolored, or painted. That’s right, just like sprinkler heads, escutcheons may not be painted. Although, they are available in multiple factory finishes. In order to replace the same model escutcheon, since the escutcheon opening is smaller than the sprinkler head itself, the system needs to be called out of service, drained, and the head removed resulting in increased labor costs. One way to solve this problem economically is to use retro-fit escutcheons. These escutcheons are “split”, having two detachable halves that allow for separation to install around the sprinkler head and fasten in place. The original escutcheon can be removed by carefully cutting one side with metal shears and separating it. Retro-fit escutcheons are available in all three common types of escutcheons; recessed, flat and adjustable. Now that you know what escutcheons are and why you need them, it’s also important to know that an escutcheon is NOT a fire sprinkler cover plate. See blog post Fire Sprinkler Cover Plates. 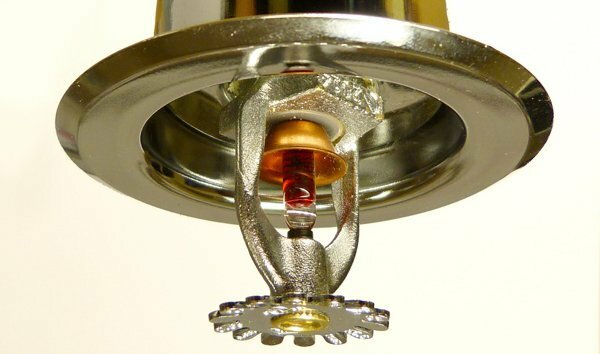 Pingback: What Size Fire Sprinkler Escutcheon Do I Need?